A little bit of gritty glamour is currently in residence at Bristol City Museum and Art Gallery, as Turner Prize awarding-winning artist Jeremy Deller presents his critically acclaimed exhibition, English Magic. 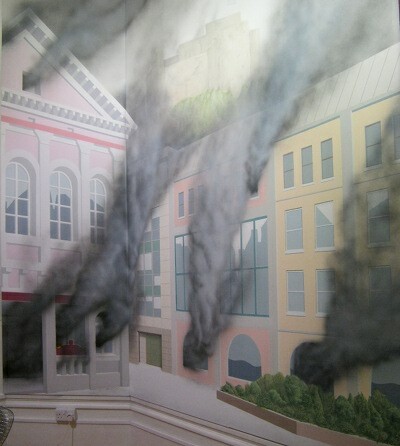 The show, which includes additions especially commissioned in response to the museum’s permanent collection, offers a curious look at the country we live in, with juxtaposed imagery, surreal responses to our tax angst, and some exquisitely political murals. Set in galleries over two floors, part one invites you to sit for a few moments on a bench repurposed from a crushed Range Rover and watch a film intersecting scenes of owls and other birds of prey with scenes of vehicles being destroyed, set to a soundtrack of a steel band playing. Glance up and you’ll notice illuminated examples from the museum’s taxidermy collection gazing thoughtfully as though you may well be the next titbit on the menu. Archive photography of Ziggy Stardust on tour is interspersed with scenes of the violence of workers’ strikes, troubles in Ireland and more. 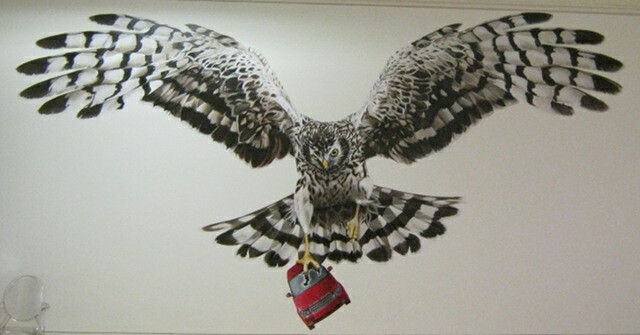 At the far end of the space, a gigantic mural titled A Good Day For Cyclists shows a hen harrier carrying off a Range Rover, providing a visual protest against persecution of the powerful against the seemingly powerless. I won’t list all the exhibits here (though the drawings by prisoners, “many of which are former soldiers” merit a mention), so will leave you with my favourite, shown at the top of this post. 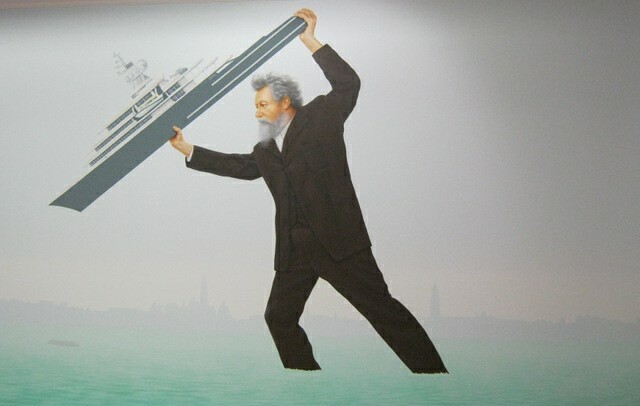 The mural shows the rise of Victorian artist and socialist William Morris from the waters of Venice to restore the view he so loved – colossus, visionary and champion of the common, everyday people – not all that unlike Jeremy Deller. English Magic is at the Bristol Museum and Art Gallery until 21st September 2014. Find details here. Hands up if you find this time of year a challenge! Yep, thought so. The utter drabness is hard-going, isn’t it? Fortunately artist Gracjana Rejmer-Canovas seems to have come up with an antidote, just in time. Gracjana’s vibrant artwork, ‘Colour Into Liquid Air’ is taking over Habitat’s Platform space on the Kings Road in London this February and March. The Slade School of Fine Art graduate has been invited by Habitat to transform its white gallery space into a sea of colour. Citing her influences as the American Abstract Expressionists and the Colour Field Painters, Gracjana will display her work as an cohesive whole that can be separated into an array of canvases of different shapes and sizes, each offering up its own intrinsic splash of life. For the project, Gracjana will dye linen and cotton canvases with natural pigments and then layer on acrylics and oil paints. Sounds satisfying, no? The boldness of the art on show could be just the thing to get you through till spring. Rejmer-Canovas’ ‘Colour Into Liquid Air’ at Platform will run until 23 March 2014 and is supported by the Polish Cultural Institute, London. A video of the making process in the space will be shown in the space on loop. Opening times: 10am-6pm weekdays 9:30-6pm Saturday 12-6pm Sunday. The exhibition is FREE to attend. I’ve always been drawn to artwork that makes use of words. This Friday a new exhibition of poetry and text art exploring concepts of mortality launches in Edinburgh – called The Dark Would. Exhibition contributors include Fiona Banner, Erica Baum, Caroline Bergvall, Stephen Emmerson, Alec Finlay, Steve Giasson, Susan Hiller, Jenny Holzer, Marton Koppany, Richard Long, Tom Phillips, poet Ron Silliman, text poet and curator Tony Trehy, author Carol Watts, conceptual artist Lawrence Weiner and sculptor Richard Wentworth. The centrepiece is a hauntingly poignant quilt, devised by experimental arts organisation arthur+martha. The denim quilt bears fragments of the life stories of Manchester’s homeless, embroidered by the people themselves. I love the way it takes anecdotes and memories and transforms them into something that can potentially keep the cold at bay. Other highlights include Mike Chavez-Dawson’s Rorschach drawings, made by writing the names of dead poets and then smearing them by folding the paper – you can see a video of him doing it here. The Dark Would will be on show at Summerhall, Edinburgh, EH9 1PL, from 7 December – 24th January, with a launch (open to public) from 7pm on Friday 6 December 2013.